I first read this charming story to Lauren when she was just four years old. Terry and I had decided to homeschool her and I jumped right in with pre-school using Before Five in a Row, a literature based unit study. I had never read many of the books used in this program, so when we found Cranberry Thanksgiving at the Topeka and Shawnee County Public Library, I was instantly taken with the sweet story and cute drawings. We made the reading of this story a tradition every Thanksgiving since then, checking it out of a library near us each year. I only recently was able to get my very own copy. I have no idea why it took us so long, but this year, we actually made the cranberry bread that is the focal point of the story! The recipe is on the back of the book. I can only wonder if maybe I was intimidated at the idea of chopping cranberries? Or maybe I meant to do it, but the busyness of the holiday season caused me to forget? I don’t know, but I do know this: it’s never too late to start a new tradition! Lauren is a long way from four years old, but she enjoyed this tangy sweet bread along with the rest of us. Matthew and I read this book a few nights ago, and I eyed the recipe anew. “I can do this.” I said. Matthew agreed and then proceeded to remind me every day. I added the ingredients to my list and took the plunge. Laci helped us, too. Spoon into greased 9 x 5 x 3 inch loaf pan. Bake at 350 degrees for 1 hour and 10 minutes, or until a toothpick inserted in center comes out clean. Remove from pan, cool on wire rack. I didn’t have a flour sifter, so I used a whisk to aerate the dry ingredients. I “sifted” the flour, measured it, then I measured out the other dry ingredients, sifted them, and stirred them all together with a whisk. I also didn’t use the orange peel. The main reason was that our store didn’t have oranges. I was going to use the peel from a tangerine, but I didn’t really have the right tool for grating it, so I omitted that altogether. I used fresh cranberries and regular raisins. It came out just fine, despite my modifications. 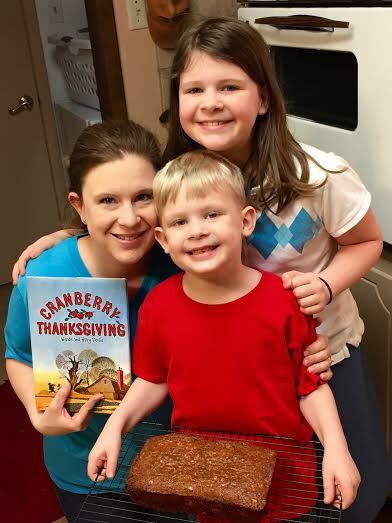 I hope you’ll be able to meet Maggie, Grandmother, Mr. Horace, and Mr. Whiskers – and enjoy some cranberry bread! – this Thanksgiving. It is a sweet book! I think we all start to reminisce when our big ones get to high school and we want to treasure those memories with our little ones, knowing it will be our last shot. What are you keeping as keepsakes from homeschool? I think about starting a library for the grandkids one day.